Very Good. Unused, minor shelf wear and scuffs to outer edges of dust jacket, book content is in very good condition. 240 p. 230 illustrations, 200 in colour. Intended for professional and scholarly audience. Intended for college/higher education audience. Very Good. 240 p. 230 illustrations, 200 in colour. Intended for professional and scholarly audience. Intended for college/higher education audience. An exploration of the many aspects of computer-aided design being used by architects around the world, illustrated with CAD models and finished buildings. 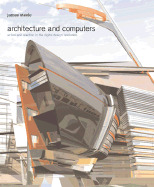 The book features prominent projects by, among others, Gehry, Eric Own Moss, Morphosis, Foster and partners, and Nicholas Grimshaw and partners. New. 1856692205 R-Never Read-may have some minor shelf wear? price inside cover-publishers mark-Good Copy-I ship FAST with FREE tracking! ! Fine/VG in VG jacket. Clean, tight, unmarked. Dj has wrinkle along top edge, half-inch tear at rear flap-fold. Dj in protective mylar sleeve. 240 pages. Discusses the effect of computers on creative identity. Illustrated throughout in color. ZSBH B4541.